This fantastic resource – developed by Dr. Elspeth Macdonald at the National Centre for Peace and Conflict Studies (NCPACS) at The University of Otago, New Zealand – merges the fields of digital photography and peace education. These broad topic areas provide opportunities to educate for peace. Peace education also focuses on the knowledge and skills related to peacefulness and nonviolence – education about peace. Education about peace aims to build knowledge and understanding about conflict and violence and about peacefulness and nonviolence – to understand concepts of negative and positive peace and the various types of direct and indirect violence. Curricula across a range of topics can include content related to problems of violence and conflict and ways to develop and promote peaceful perspectives. It uses a critical pedagogy to develop understanding of multiple perspectives or viewpoints and to critically appraise these – to understanding “why things are the way they are, how they came to be, and what can be done to change them” (Teachers Without Borders). In peace education, the analogy of viewing though a lens has been widely used to describe the framing of perspectives related to conflict, violence and peacefulness. Taken further the concept of viewing though a critical or analytic lens incorporates the underlying critical pedagogy. Peace education can provide students with an analytic lens or series of analytic lenses to view and evaluate particular events and circumstances. These lenses can be used view and evaluate situations of conflict and violence, peacemaking, and a range of social and environmental issues impacting on individuals, families, communities and societies. 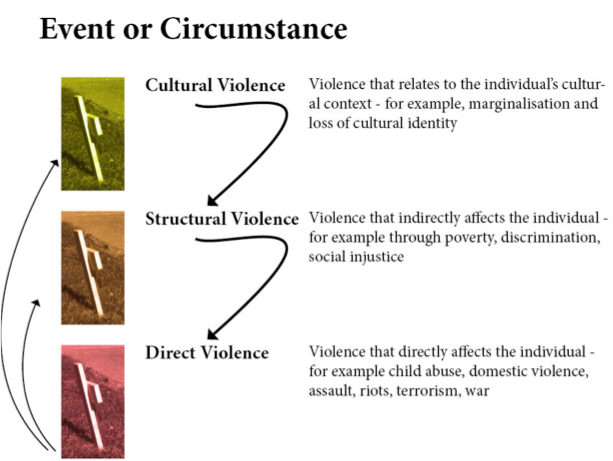 While the lens analogy has been commonly used by peace educators and scholars to describe the activity of focussing on violence and peacefulness, to date this description has not been operationalized. What tools can help educators teach about concepts of violence and peacefulness and assist students to explore perspectives surrounding particular events and circumstances? If teachers are addressing climate change in their curriculum on environmental education they can look through the peace education lens to adapt their teaching resources.Teachers can assist their students to be peace photographers and to apply analytical lenses to view and understand events and circumstances from a peace and conflict perspective. This resource uses visual depictions and graphics to communicate complex and interrelated concepts. The aim is to provide an objective representation to facilitate students’ understanding of events and circumstances from a peace education perspective. It uses photographs to represent a range of events and circumstances and applies photographic processes to examine various concepts.This Peace Education Lens resource uses visual depictions and graphics to communicate complex and interrelated concepts. The full pdf can be downloaded here.